We celebrate the Paschal Mystery with a Triduum ( a period of three days): Holy Thursday begins this period of time the Church gives us to gather in commemoration of Our Lord’s Passion, Death & Resurrection. On this holy night our Lord gave us the Eucharist–His own Body & Blood, His promise He would be with us until the end of time. Papal Artifacts wishes all of you the opportunity to share in this mystery, this Supreme Gift, in your many parishes. 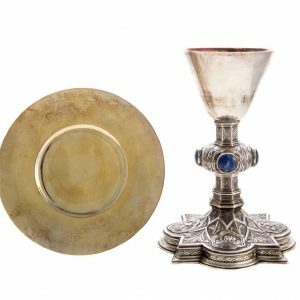 The Featured item is a silver chalice belonging to Pope Leo XIII that he both used and gave as a gift to commemorate the 50th anniversary of his priesthood in 1887. It’s all silver with his papal coat of arms engraved on its base. As precious an item as this is, it really is because it leads back to the Eucharist, having contained the Precious Blood of Christ. It all leads back to Jesus Christ, sacramentally. 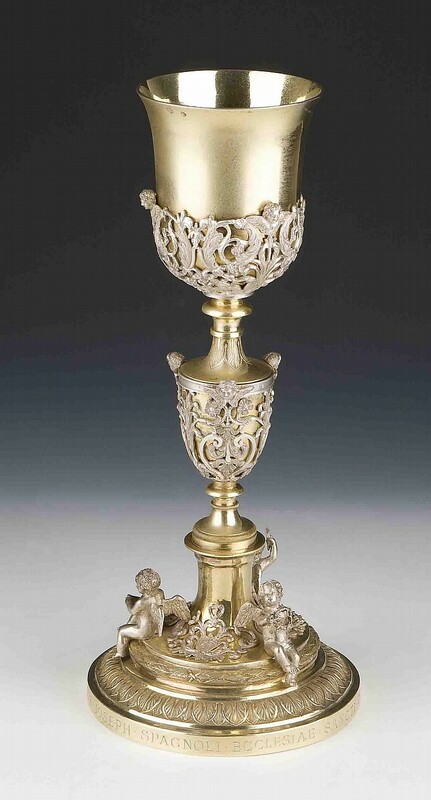 So, as spectacular as the chalice is, what’s more important is what has been inside of it. 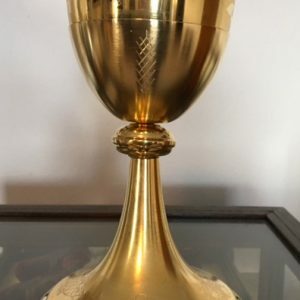 So we can look at this and be amazed to think Pope Leo XIII used this, but what’s more amazing is that Christ shed his blood and gave it to us to drink, and this vessel contained it. Because I am a priest of the Diocese of Duluth, I’m aware Pope Leo XIII established our diocese in 1889. So, it’s really special to have this tangible connection to our founding Holy Father. for the Christian faith. What we commemorate this week is the center of our universe and the whole reason why we are Christians. the Easter Vigil on Saturday night is considered to be one continuous liturgy. I would encourage you to go to all of the liturgies, but if you were to be only at one of them, then go to the Saturday. 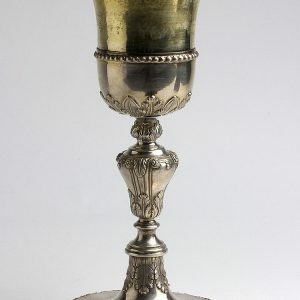 What follows are brief commentaries on the other chalices we are featuring on this Holy Thursday. 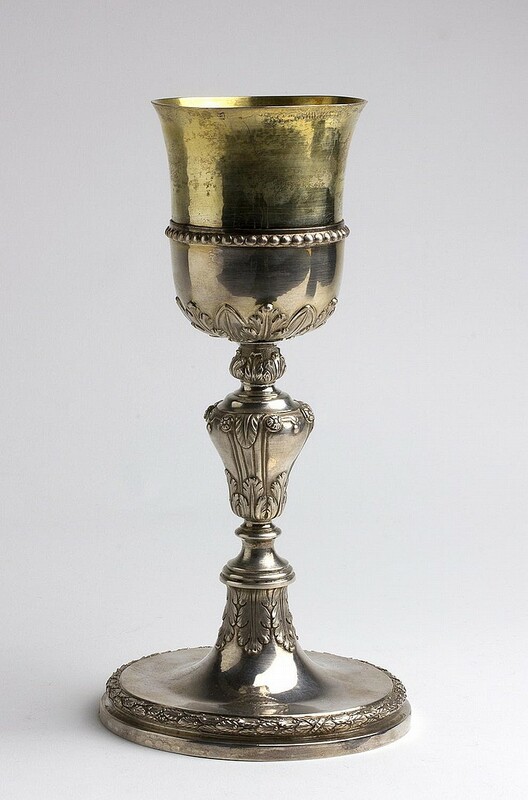 The artifact presented here is a solid silver chalice featuring the coats of arms of two 19th century popes, Leo XII and Pius VII. 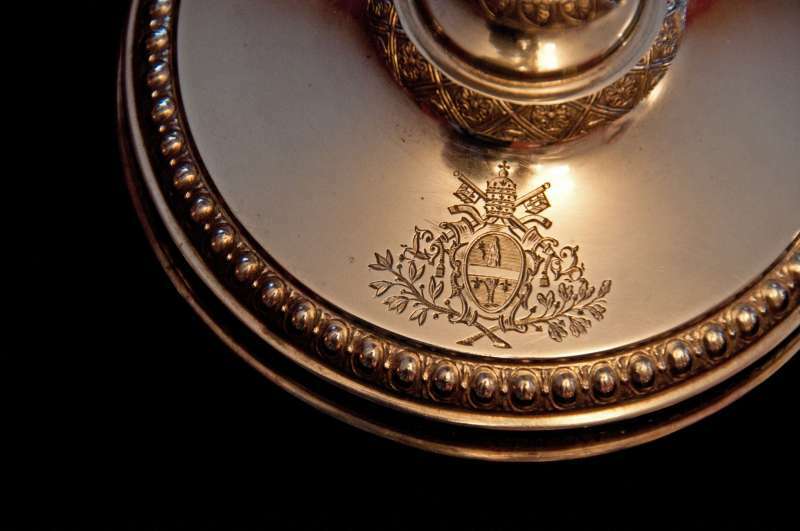 A unique feature of the chalice is the depiction of their coats of arms on its base as well as a bishop’s coat of arms to the very right. 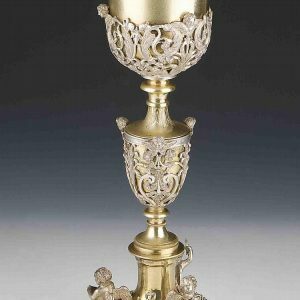 It is surmised that the recipient of the chalice may have been a bishop who was head of the papal household, probably serving for both popes, who reigned consecutively between 1800-1829. 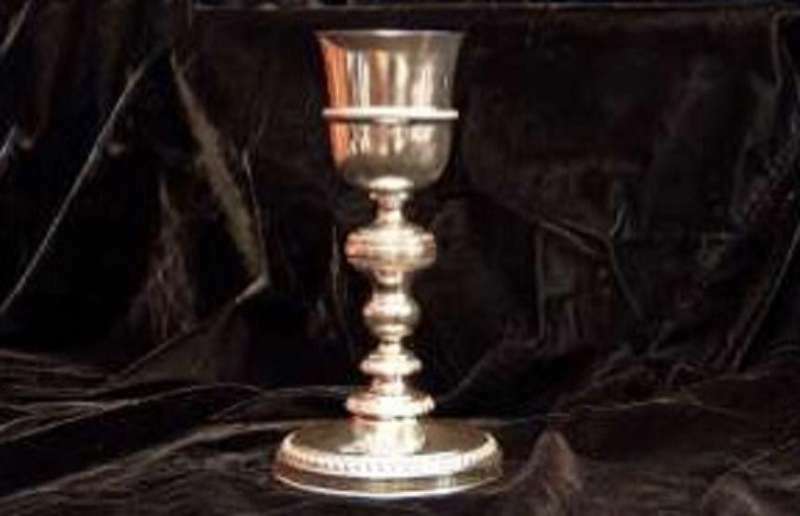 The whole chalice is silver with his papal coat of arms engraved on its base. 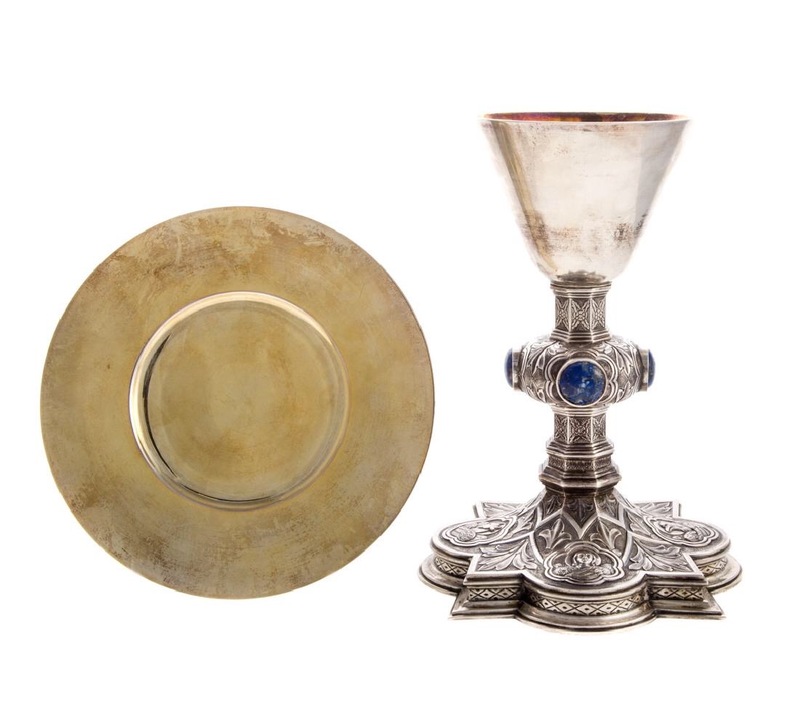 This chalice & paten have the rare distinction of having been used by Pope (now Saint) John XXIII on June 16, 1959, during the celebration of Holy Mass at the Vatican. A certificate authenticating this date is included. They were purchased for the ordination of Gaston Rosaire DesHarnais, a Roman Catholic priest, who lived in Rome in the late 1950’s. The lapis lazuli cabochons were purchased and blessed at the Shrine of Guadalupe in Mexico City. 5. 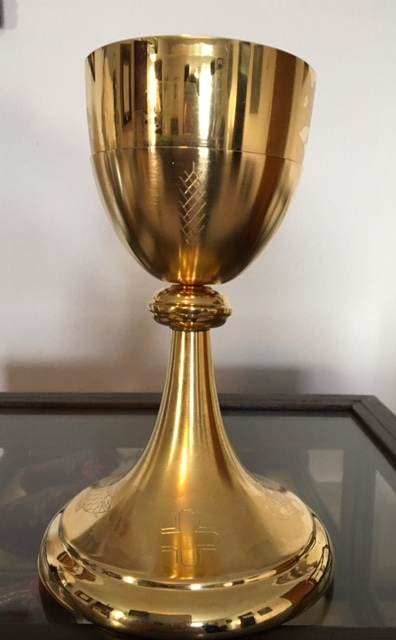 This chalice featured here is from the era of Blessed Pope Paul VI, specifically 1976. 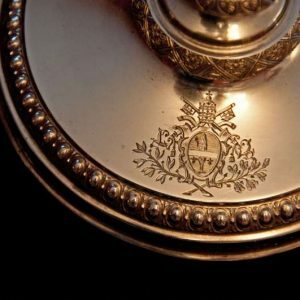 The inscription on the bottom of the chalice states it was given as a gift by the Pontiff that year–just two years before his death in 1978. It is incredible to have any item connected to one of the pontiffs of the 20th century who has already been created Blessed.